This page presents a summary of the Wikipediao’, Wikipedia in Yucatan Maya case study. For the full report, click here. On the discussion page, you can post your comments, observations or suggestions about the site content. The Maya (‘maaya t'aan’, in the Mayan language) is the majority indigenous group with the lowest dialectal variation in Mexico. The Ethnologue distinguishes two variants: 1) one spoken by 40,000 people in the central area of ​​Quintana Roo, which corresponds to the area occupied by the Cruzoob; 2) another spoken in the rest of the Yucatan peninsula. However, INALI (2007) recognizes a single language form. It belongs to the Mayan Linguistic Family together with the Mixe-Zoque, the Totonac, the Huasteco, and the Ch'olan languages, among others. Wikipediao’ is the version of Wikipedia in Maya and represents the most advanced project of the Wikipedia incubator. It started on May 29, 2009. As of March 3, 2017, it has 1,004 articles and 121 registered publishers, of which only 25 have contributed more than once and 2 are active. Es conocida comúnmente como maya, aunque muchos lingüistas emplean el término maya yucateco para distinguirla de otras lenguas mayenses. It is commonly known as Maya, although many linguists use the term Yucatec Maya to distinguish it from other Mayan languages. Source: Statistics of the Wikipedia in Mayan Yucatan, May 31, 2017. The project began on May 29, 2009 under the ISO3-yua, Yucatec Maya code. It was created by a Wikipedia user of Mexican origin and editor of Wikipedia in Náhuatl. Subsequently, other non-Mayan users were incorporated into the project. The first native speaker got involved in the project two months after it started, but did not continue. The biggest contribution of content is by the creator of the page (3,639 editions), by bot (2,133), and by anonymous users who did not register on Wikipedia (1,008). The first word created on Wikipediao’ was Yu'ukat'aan (‘welcome’, in English) which became the homepage of the project. Photo by Muñoz LC and available at Wikimedia Commons licensed under the Creative Commons Attribution-Share Alike 4.0 International license. Since the Spanish conquest to the present time, the Mayan language has been using Latin characters. There is an official alphabet created by linguist specialists in 1984, which is officially recognized and used in the textbooks distributed by the Mexican state. Although, among the speakers and even the language experts, there are differences in terms of interpretation and orthography. The Mayan edition of Wikipedia has been using this script since July 2009. As Maya is the second most spoken indigenous language in Mexico, in 2012 the Wikimedia Foundation, along with other Foundations such as Mozilla and Google, promoted localization and content creation events in the Mayan language on their platforms. However, they did not manage to form a community of native speakers who could continue the project. 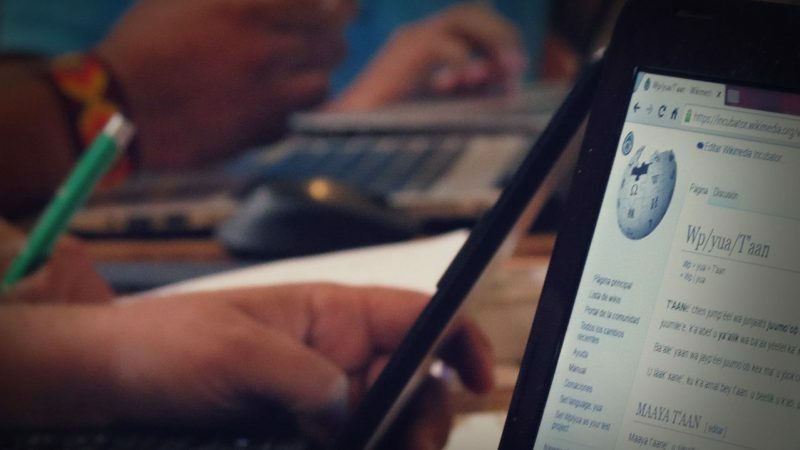 In 2015, at the Wikimania 2015 event held in Mexico City, Wikimedia Mexico again gave a boost to the creation of the Wikipedia in Maya by extending an invitation to collaborate in this language. 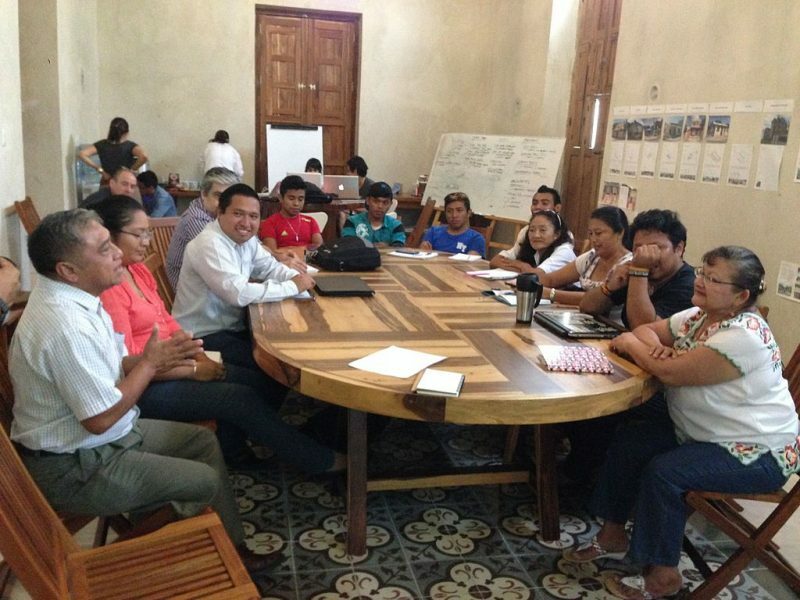 Finally, in 2016, a workshop was held in Mérida, Yucatán, with the objective of setting up a main team of editors to sustain, manage and keep this community active. At this stage, six new editors contributed to the encyclopedia; however, they did not continue in the following months. Regarding the profile of the Wikipediao’ editors, out of the 24 registered users with editing activity, there are only two native users, of which only one contributes to the editing of contents. Four users contribute with 88% of the content in Maya. The only registered native user contributes only 0.3% of the editions. It should be specified that the percentage of contribution by the native speakers can be a little higher since they are within the category of anonymous users. During the training workshops, the number of users and editors increases considerably, but they only contribute or create their accounts within the framework of the event and then there are no records of them contributing at any other time. To identify the challenges faced by native speakers, and their motivations as Wikipediao’ editors, we interviewed Maya editor Lorenzo Itza. Lorenzo Itzá is a Yucatec Maya speaker from Mérida Yucatan and an advisor on Mayan language communication projects on virtual platforms. He joined Wikipediao’ in 2012 after participating in Free Software localization projects, particularly with the Firefox browser of the Mozilla Foundation. His involvement into the Mayan version followed an invitation from a Wikipedia user to review the existing contents of Wikipediao’. Currently, his work focuses on localization for the Wikipediao’ interface, through TranslateWiki. He considers that the biggest challenge for the project is to become an active initiative that grows and works in a similar way to the Free Software communities, which have many similarities with the concept of “community” of the Mayan and indigenous communities. Perhaps it is possible to transfer traditions such as tequio (collective work) in the digital medium. The support by the universities also presents a great opportunity for the creation of a Wikipediao’ community that is sustainable in time. For Lorenzo Itzá, Wikipediao’ must become a consultation tool for Mayan speakers, as is the case with the rest of the encyclopedias in other languages. The platform must contain information for the Mayan language speakers and become a platform that shares information for adults or young people, academic and non-academic, unites different ways of thinking of people who are not communicating now and thereby enrich Wikipedia. Wikipedia can be a place with information about indigenous languages. I would like to see more information in Maya about foods, traditions, rituals, descriptions of the villages, but also current technology. Wikipediao’ is a platform that provides information on Mayan traditions and current technology. 1. Establishing of a community that manages the project. The main limitation presented by the project is the creation of a community that can sustain and manage the project in the long term. Although the chapter of Wikimedia Mexico and its allies have made many efforts, together with other organizations, to strengthen this project, to date there is no active and continuous participation of editors in Mayan language. The vast majority of content generation only takes place within the framework of events or training. Despite a considerable number of articles written in Maya (1,004), many of them have limited content that needs to be improved or their content can be used for other Wikipedia projects, for example the Wikidictionary. Although several training workshops have been held, it has not been possible to sustain the motivation for maintaining a local group of active users to administer the project. Although there is a lot of demand and high expectation of the users, they do not continue with the creation of the content. Their contributions are only made in the framework of the workshops and there is no appropriation of the tool. Lorenzo Itza considers that this problem may be due to the fact that there has not been an effective communication and dialogue between the promoters of Wikipedia in Maya and the Mayan community. On the one hand, the promoters of the project do not know the richness of the Mayan language and its dynamics, and on the other hand, the Mayan community does not know the philosophy of Wikipedia and its relation with the collaborative knowledge based on Free Software. The use of standardized writing and Latin characters facilitates communication and dialogue among editors and allows them to write and read the contents in Maya. Also, the richness of Maya language helps create content on the encyclopedia. Recognize that the participation of native speakers, and their formation in their places of origin, will strengthen the appropriation of the tool.